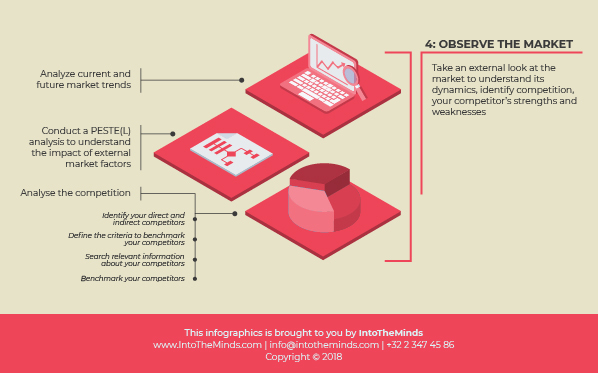 How to do market research? This is the question we’re helping you to answer with the publication of our online step-by-step guide to market research. Each of the 7 phases of our market research methodology is accompanied by a post on this blog. Today we’ll be dealing with Phase 4: the PESTEL analysis and the competition analysis. Phase 4 focuses on using secondary sources to get a better understanding of the market dynamics. To this aim we’ll introduce you to 2 types of analysis: the PESTEL analysis and the competition analysis. The PESTEL analysis stands for Political – Economical – Sociological – Technological – Ecological – Legal analysis. It consists in assessing all the factors which you can’t influence but have nevertheless a great impact on the market dynamics. Doing a PESTEL analysis will ensure you cover all those factors and identify well in advance the possible threats to your project’s success. Doing a competition analysis belongs also to Phase 4 because it can mostly be based on secondary type of information (books, websites, financial statements, academic articles, professional reports, …). Needless to say, a competition analysis is instrumental. It needs to be carried out as objectively as possible to remove biases from your conclusions and give your faithful account of the hurdles you will face when entering the market. Our step-by-step guide will help you find the right sources and methods to carry it out. Don’t hesitate to comment this post on Twitter, Linkedin, Facebook or more simply at the bottom of this page.